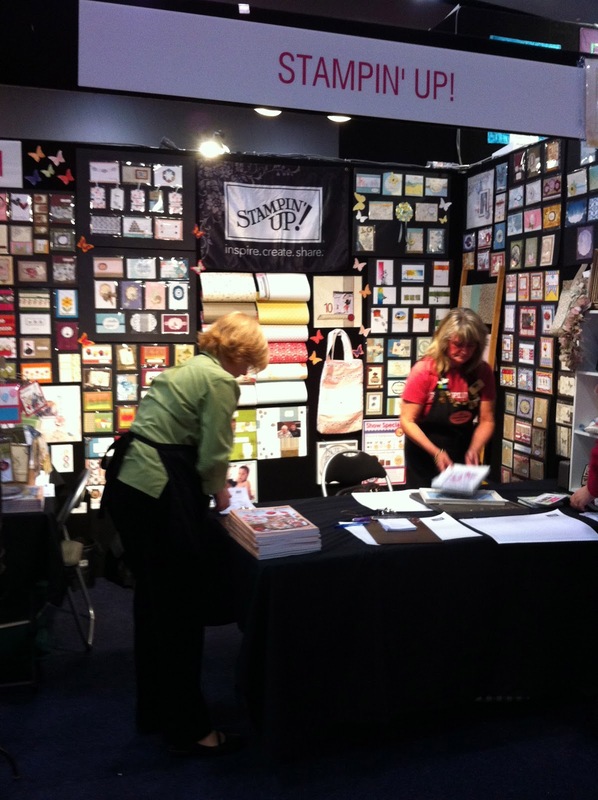 Last week I had a great time working at the Craft & Quilt Fair in Melbourne and had the opportunity to demonstrate our great new tool - the Simply Scored Tool. While there are lots of different tools like this out there, none of them in my opinion match the price and quality of this product. 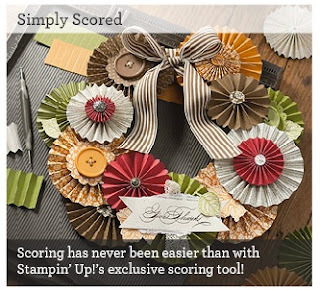 If you are new to the Simply Scored there is a great video HERE made by Stampin' Up! that explains how to use both the metric and imperial score plates and how to make the rosettes. 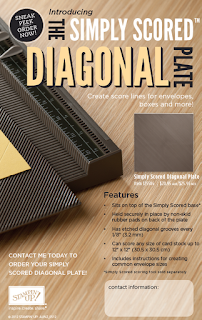 The Diagonal Score Plate was a new addition recently for Stampin' Up! and for those of you that have the whole package and want to make envelopes or fancy cards here is a great video to show you how. There are lots & lots of videos on YouTube that demonstrate this tool - these are just two I selected for you to watch. If you have just bought this tool then Congratulations on your new purchase! It is an amazingly easy tool to use and so versatile. I am enjoying using mine and can't wait to show you more creations....stay tuned! On Owl In A Dress? Wow what a busy weekend! In amongst all the activity of the weekend my daughter had a birthday party sleepover to go to. So, this required a card. Dana asked me to create her a card using a bear in a ballet skirt. I do not have any bears so decided to surprise her with an owl instead. I love a good owl don't you? I used the Twitterpated DSP and some pleated ribbon in Blushing Bride from the Autumn -Winter Mini catalogue that ends today. 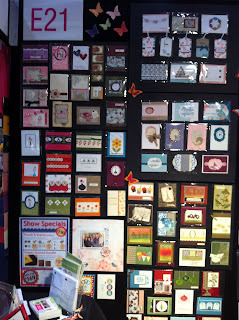 The 2 stamp sets I used are a sneak peak from the new catalogue called Memorable Moments & Itty Bitty Banners. Remember today is the last day to order from the Autumn - Winter Mini Catalogue. Contact me on 0411113530 to place your order before time runs out! 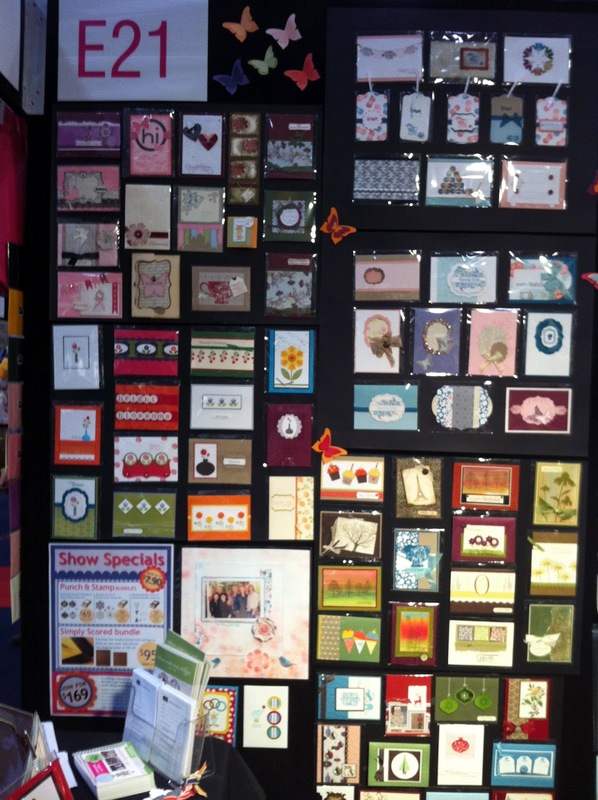 Stamp Sets: Memorable Moments, Itty Bitty Banners, Mixed Bunch. Paper: Twitterpated DSP, Whisper White, Basic Grey, Blushing Bride, Early Esspresso & Crumb Cake (owl). Ribbon: Blushing Bride Pleated Satin Ribbon. 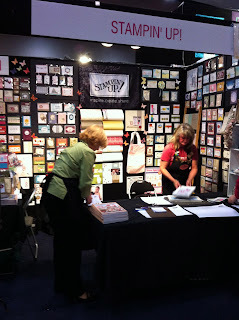 Here are a few photos of us setting up on the 1st day of the show. 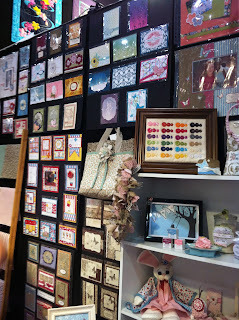 Boy that place got crazy crowded and our stall looked so nice & cozy amongst all the others. Some of the 3d items - how cute is that rabbit! 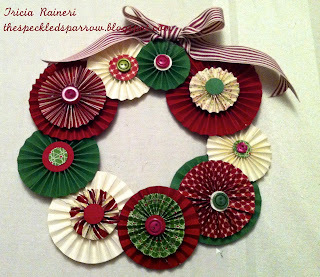 My Simply Scored Wreath - instructions in a new post coming soon! Did you do a make & take at our stall? Do you have any tips or feedback for us? OMG now, that is a miracle isn't it! Plus it is a 12x12 too! I really have a hard time creating scrapbook pages with stamps. I wanted a flat effect, so no big bulges of buttons or ribbons. I suppose you could call it a CAS ( Clean & Simple) page. Stamp Sets: Creative Elements, Itty Bitty Bits. 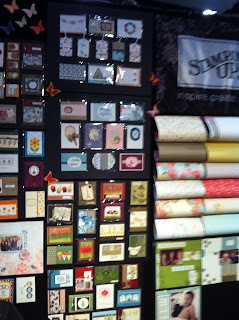 Paper: Patio Party DSP ( Sneak Peek), Letters To Santa DSP, Whisper White, Baja Breeze, Early Espresso. Ink: Early Espresso, Baja Breeze. Cool Tools: Big Shot, Square Lattice Embossing Folder, Timeless Type Junior Alphabet Sizzlit Die, Full heart Punch, Itty Bitty Punch Pack. Labels: 12x12, Full Heart Punch, Itty Bitty Bits, Itty Bitty Punch Pack, Patio Party DSP, Scrapbook Page, Timeless Type Junior Alphabet. One of my old friends has just had her 1st baby and after seeing her gorgeous owl inspired nursery I had an idea for her baby card. I was just waiting for the little one to arrive before I chose colours. Congratulations Jo & James on the arrival of little William! 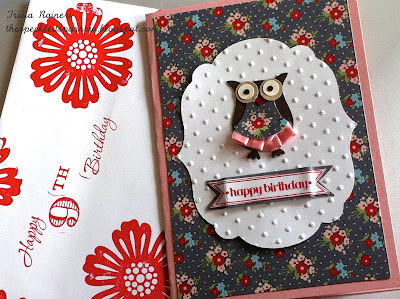 It is a Clean & Simple (CAS) card using Marina Mist, Pool Party & Island Indigo. Stamp Sets: Aviary, Out On A Limb, Friendly Phrases. Paper: Pool Party, Whisper White, Island Indigo. Ink: Soft Suede, Marina Mist, Island Indigo, Pool Party. Ribbon: Pool Party 3/8" Ruffled Grosgrain Ribbon. Labels: Aviary, Baby, Friendly Phrases. This year, the ‘Heartfelt’ theme celebrates the introduction of the holiday catalogue, so be prepared for lots of exciting, Christmas-focused things to see and do. This new-style event will offer ideas and inspiration, product and technique tips and a chance to have fun with your friends. Be prepared to enjoy a range of activities and a selection of presentations—to attend at your leisure! Most activities will run concurrently, so you can choose where and when to spend your time. Activities include Product Playground, Make & Takes, project displays, demonstrations and more! In addition, we will offer four inspirational crafting presentations by some of our most talented demonstrator (and staff) presenters. See one of them or all of them—you choose! Experience hands-on learning and a chance to see and try Stampin’ Up! products—including some of our latest releases. Have a go at various techniques and see project displays created by our talented demonstrators. Registration includes a Make & Take kit and the Clockworks Stamp Set (valued at $41.95 wood-mount / $33.95 clear-mount) from the new annual catalogue. The kit includes materials for four cute projects and tips on how to make them. 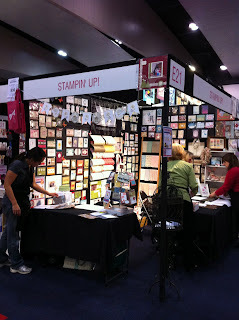 All supplies will be provided by Stampin’ Up! Spend as much or as little time as you want to create your Make & Takes—whenever you like! Our Share Boards will provide an opportunity for you to show off your creativity! Add your own project to the boards and gain inspiration and ideas from all of the share projects. Presentation projects and a variety of other projects will also be on display, so be sure to bring your camera! Be wowed by a variety of creative presentations throughout the day. 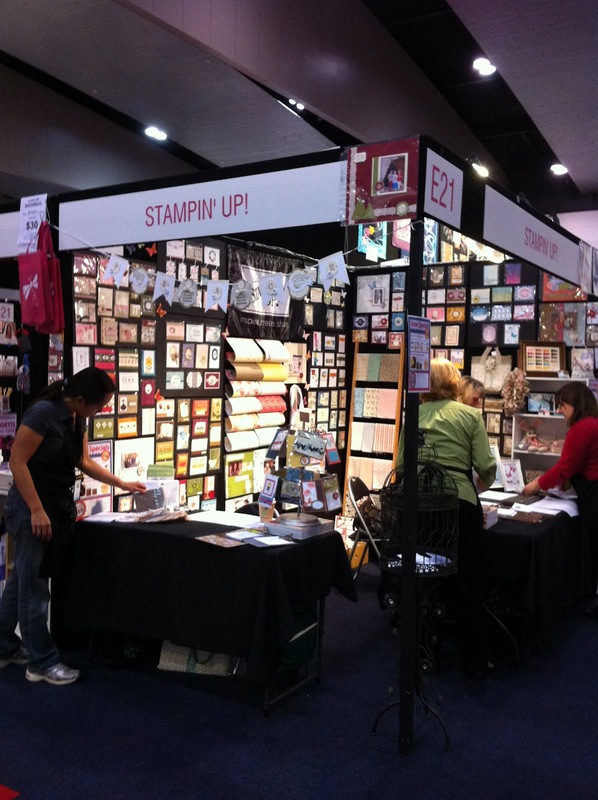 The $120 fee provides you with access to all activities and presentations at the event, lunch, the Make & Take kit and Stampin’ Up! products (including the Clockworks Stamp Set and more)! Welcome to the worlds longest post! It has been a long while between posts as unfortunately (or luckily) I came down with the flu the day after the fundraiser. While I am still sick and on lots of antibiotics and pills of all sorts I am soldiering on (woohoo I even got dressed today)! I thought I had better at least make an effort here and show some of the photos from the day. Most importantly we met our $1000 goal so well done to all involved and well done to everyone for either coming along and joining in the fun or helping out on the day. Red Nose day has a special meaning for both myself and Robyn my downline. We have both used the services of SIDS and Empty Arms by using the counselling they provide after we lost our precious little babies Scarlett & Mathew. So this fundraiser was entirely dedicated to them and I hope that the money we raised goes towards helping others who have to face the loss of a child, get through that difficult time. 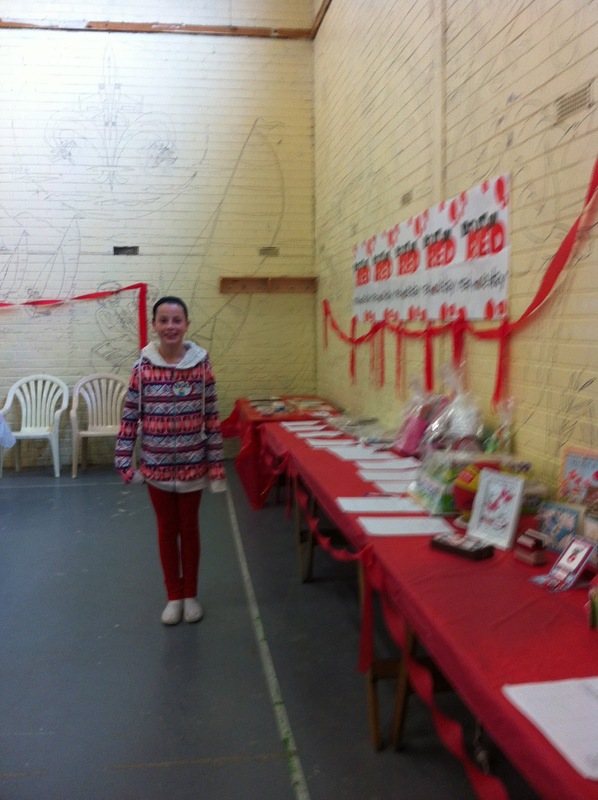 My door lady Leonie guarding our Big Raffle prize - the calm before the storm! The Creative Crew - my WONDERFUL team of helpers! From left back row - Konni, Hannah, Leanne & Robyn. From left (front row) Me pulling my stupid face, Karen & Bron. I also need to thank both my mum Lozza & my sister Vicki who worked hard in the kitchen pumping out the devonshire teas and refreshments and also Leonie for coming all the way from Berwick for the day (she is also the the reason I am addicted to Stampin' Up!) & Indiah & Hollie my little helpers. 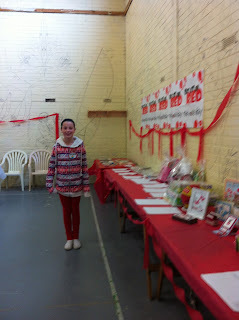 Special mention goes to Leslie for providing the comic relief on the day - ;0 and to Jessica for winning the Raffle! Most of all thank you Stampin' Up! for your generous donation of a fundraising box of goodies, Lisa who donated the fishing charter prize, Leanne for the prizes she donated & to Leopold Scouts for donating the use of their cold but perfectly sized hall. Now it is all over we look forward to an even bigger and better fundraiser next year!